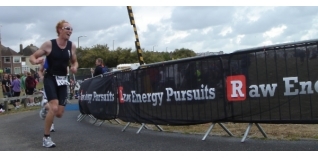 Mick Dicker from Raw Energy Pursuits (www.rawenergypursuits.co.uk) reports on the National Ranking Series Cuff Miller Worthing Triathlon. 30mph winds the day before the race looked like putting the race in jeopardy, but despite some distinctly murky sea's early on Sunday morning, the swim times were some of the quickest for a number of years. This year, as well as the Man v Woman format, with the first across the line winning the cash prime, a Vets wave was added to the mix. Women start at 6:15am, followed by the Vets at 6:19 and then the Seniors and last years winner Colin Dixon at 6:31am. Tuff Fitty's Nicole Patterson was first out the water in 22:16, just ahead of Manuela Capazorio, Katie Silke and Elisabeth Brama. The Vets were lead by Bob Novis in 20:36, but close on his heals was three times winner Colin Dixon, Carl Shaw and Deon Coetzee in just under 18 minutes. The usually strong current had all but disappeared this year due to the late tide. Onto the bike Thames Turbo's Liz Pinches, Coventry's Danielle Stewart and Brighton Phoenix's Brama were making the early progress. Tri UK's veteran Kevin King made light work of the rolling bike course and was first into the transition with a good lead and as he started the run on the prom he never looked like relinquishing it despite seeing the Seniors cutting into his lead. King eventually won the 'first across the line' cash prime, however it was Dixon who totally dominated the race for the fourth successive year winning in an impressive 1:54:45, 90 seconds ahead of second placed Tom Sturdy (Team Nemesis) and third place Matt Ellis (Human Performance Unit). Coventry Cycle Centre's Danielle Stewart clocked the fastest bike and run times to win by almost four minutes ahead of Farnham's Manuela Capazorio and Elisabeth Brama. Team REP's Niki Treacy was first Veteran and Steyning AC's Joan Lennon was first Supervet together with MAD Tri's Nick Ballard. Only seven seconds separated the top two Relay Teams with Czech12 taking the honours ahead of Tuff Fitty's 'Tuff at the top'. Bike Designers and Distributors 'Upgrade' were at the event with some very impressive Lezyne goodies and Kinesis carbon fibre bikes.